Long established and family owned trade printer, Craig & Parsons, has installed a Mark Andy Digital One press at its plant in Folkestone, Kent, to handle short run work for its extensive portfolio of well-known high street names. Most of which it supplies through print management companies. The Digital One joins a bank of six narrow web flexo presses that includes a Mark Andy 2200 UV-flexo press that was itself responsible for bringing four-color work in-house. Nikki Gordon and Steve Craig with their hard-working Digital One press. The result is a high quality label printing and manufacturing business that is aware of the requirement, budget, and timescale of each customer, and the latest investment in digital print technology highlights the company’s determination to stay ahead of its competitors. The acquisition of local label converter Speedstick’s business in 2015, and the installation of its 2200 press allowed Craig & Parsons to open new CMYK business, including some direct with customers. The new Mark Andy Digital One will bring further diversification to short run work. With most of the UK’s leading supermarket retailers and office suppliers among its indirect customers, Craig & Parsons was looking for technology that offered flexible production capability with high-end quality. But, there was little on the market that met the company’s criteria for cost-effective production until a visit to Labelexpo in Brussels changed its mind. 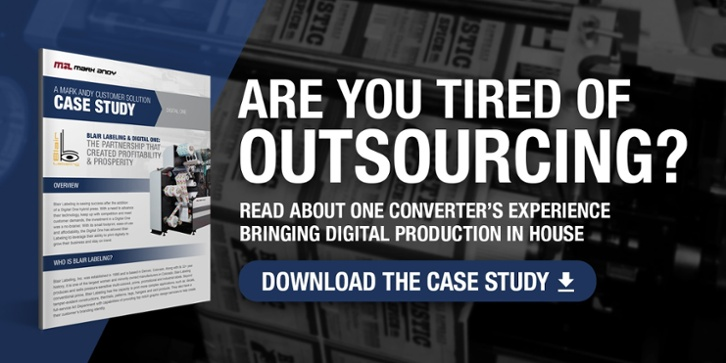 “We had been waiting a long time for a digital print solution like Digital One - it was an impulse buy – we saw it, liked it, and bought it!” said Nikki Gordon. In particular, the company appreciated the print quality from the dry toner unit and the fact that the single flexo print station can be used for an additional color or varnish. Digital One also offers cold foil and laminating inline, and the die cutting unit accepts the tooling from the company’s existing 2200 press. “It was something of a no-brainer for us – especially as it will run virtually any stock, without pre-treatment, and there is no click charge,” she added. Installed in January, the Digital One has already passed 30,000 linear meters, and Craig & Parsons is finding it a useful tool for attracting short run process work, like that required from smaller manufacturers and artisanal suppliers. 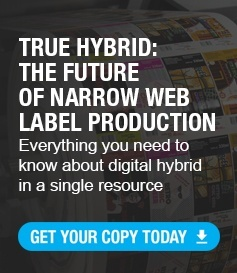 Its capacity for handling multiple versions of the same label is proving very cost-effective. Proud of its record of funding all investment from company resources, Craig & Parsons is working towards BRC accreditation for its 12,000sq/ft facility and 21 staff. The Digital One was part of a £350,000 investment that included future-proofing the site for expansion. In the past year the company has added six new staff to its single shift operation, which, with the new press, has shortened many delivery times to "same-day."